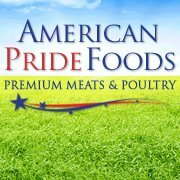 Alaskan meat and poultry distributor, American Pride Foods is already one of The "Q" Review's favorite sources for meat. In addition to beef and poultry, American Pride specializes in Alaskan raised game like buffalo, reindeer and caribou. I previously reviewed a few of their most popular products (See Review). I was really excited when they contacted me saying they were ready for round two. This round features three unique products that I found even more intriguing than the first batch. American Pride Foods sent Buffalo Bratwurst, Caribou Sandwich Steaks and Bacon Wrapped Reindeer Medallions. As before, my meat was shipped overnight from Alaska to North Carolina and arrived frozen. Bacon Wrapped Reindeer Medallions: The reindeer medallions are cut in round, four ounce portions. Each medallion is wrapped with a slice of bacon and vacuum sealed. The steaks are sold in packages of two. These steaks present beautifully on the grill and on the plate. They are great for gourmet dinners or family cookouts. I grilled up both medallions for a weekday dinner treat. I simply seasoned the steaks with black pepper before they hit the hot grill. The salty, smokey bacon provided all the extra flavor that the medallions needed. Over high heat, the steaks hit medium in a matter of minutes. These steaks are easily my new favorite product from American Pride. They were absolutely delicious. 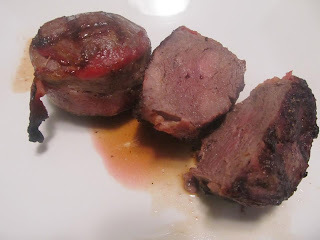 The meat was tender and flavorful, like prime beef. It wasn't gamey like the wild venison I'm used to eating. I enjoyed these medallions as much as any steak I've eaten in a long time. Caribou Sandwich Steaks: These unique sandwich steaks are a blend of ground beef, pork and caribou. The meat mixture is seasoned and pre-cooked. They are vacuum sealed with eight steaks per pack. I thawed the sandwich steaks and grilled them for about three minutes per side. They browned up nicely and smelled delicious. The steaks have a texture that is very similar to a flattened bratwurst. They're pressed meat rather than actual steak so their isn't any tearing. They're tender and juicy. The flavor is mild and savory. It falls somewhere between a steak and a sausage. They are excellent on a sandwich or right off the grill. 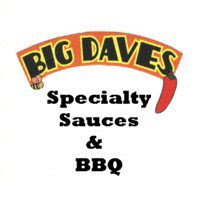 I dipped some of them in steak sauce and a variety of BBQ sauces. The only negative I could see was that they were a bit greasy. The pork was sure added to provide fat and flavor. That being said, they weren't any more greasy than a traditional grilled sausage. Buffalo Bratwurst: These buffalo brats mix ground pork and beef with Alaskan buffalo meat. The brats are pre-cooked and sealed in 16 oz packages (5 links). Each link features a natural casing that provides a nice snap when you bite into it. The meat is really well seasoned with herbs and spices. They aren't super salty, but they pack plenty of flavor. A couple minutes on a hot grill are all it takes to heat these links. They would be great for camping, cookouts or quick week night dinners. I have to say these mild brats were a very pleasant surprise. As with many of the American Pride products, they greatly exceeded my expectations. The flavor and texture were both excellent and I was impressed by their lack of grease. They seemed much leaner than the fresh brats I typically grill. American Pride Foods has an extensive catalog of exotic meat products available. The three products above are just a small sample of what they have to offer. Be sure to check out their website. To see the star ratings for these products, check out our "Product Reviews" page. 0 Response to "American Pride Foods (Round 2)"